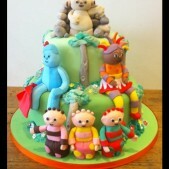 Iggle Piggle Iggle Onk….. We all know and love the tunes and rhymes so join in with Cakes by Robin and celebrate with an In The Night Garden birthday cake! We can also create Igglepiggle cupcakes, Upsy Daisy cookies or Tomliboo cake pops, just let us know what you’re plans are, how many you need to feed and let us surprise you with a delicious ITNG cake. 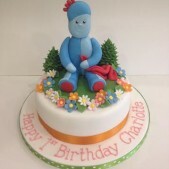 These popular cakes are always so eye-catching due to the multitude of bright colours of the characters so whether your little one is a fan of Makka Pakka, the Pontipines or the Wottingers, the Haahoos, the Tittifers, Pinky Ponk or Ninky Nonk or just Igglepiggle and Upsy Daisy, we’re sure that by the time you’ve decided on which characters to have on your cake you will also be familiar with all of their names! 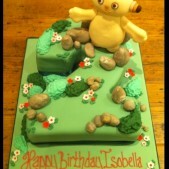 Depending on your budget we can offer 2D and 3D cakes.